The chart depicts the standard designations for copper alloys. 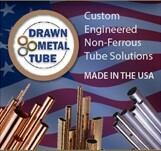 The listing can provide a workable method for identifying and ordering mill products for all your fabricating needs. Under the chart are a listing of downloadable CDA sheets that include more detailed information about each alloy.